Mid 18th century, with later alterations. 2-storey, 3-bay near-symmetrical inn, in use as public house. Tooled sandstone ashlar, painted, with polished ashlar margins. Base course; corniced lintel at ground; eaves course. NW (PRINCIPAL) ELEVATION: 7-bay, pilastraded public house front at ground, comprising 2-leaf, 4-panel timber door centred at ground, flanked by windows and with further windows in penultimate bay from right, and outer left, remaining bays blank, with decorative wall-mounted painted timber public house signs. 3 regularly-spaced windows at 1st floor. Painted timber public house sign on wall-mounted decorative wrought-iron bracket, depicting relief of St Edward's Crown upon cushion. NE ELEVATION: adjoining neighbour in terrace (15-23 High Street, see separate listing). SE (REAR) ELEVATION: not seen, 1999. SW ELEVATION: adjoining neighbour in terrace (9 and 11 High Street, see separate listing). Predominantly plate glass timber sash and case windows. Grey slate roof, with lead ridge. Cast-iron rainwater goods. Brick gablehead stack; coped, with circular and octagonal cans. Coped skews. 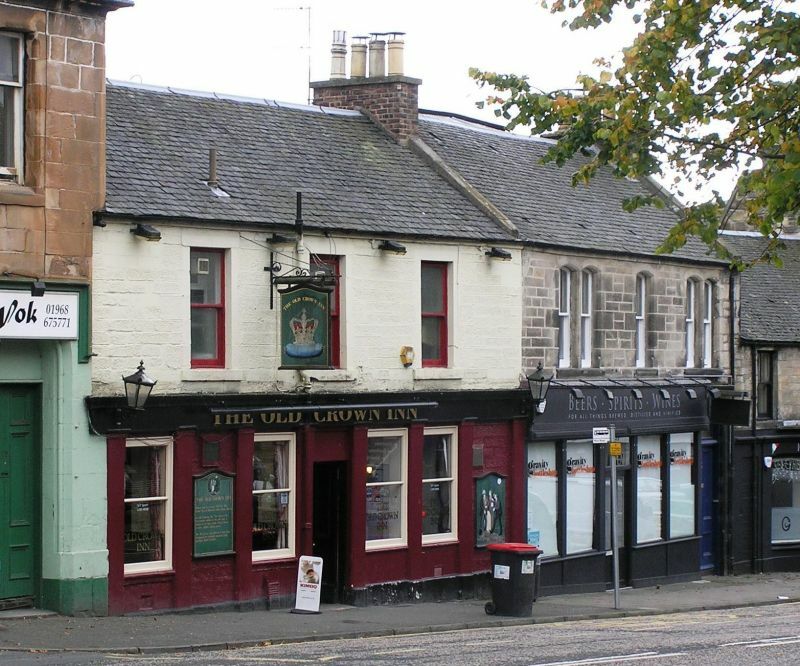 The Old Crown Inn is of interest for its original date, now much altered in the High Street, and for its pilastraded front, a feature of Penicuik's commercial structures.